Looking for answers to your jaw problems? The temporomandibular joint (TMJ) is formed by the mandible or jaw bone joining with the temporal bone of the skull, just below and in front of the ear. You have a TMJ on each side of your face. Each joint has a cartilage disc inside keeping the temporal bones and the mandible bone apart to prevent the bone surfaces from wearing and damaging each other, as well as acting like a shock absorber for the joint. The jaw joint is surrounded by a capsule or envelope, which encloses it. TMJ/TMD is an acronym for temporomandibular joint dysfunction or disorder. This is an umbrella term for a complex number of symptoms, which occur when the jaw joints and associated muscles are disrupted. 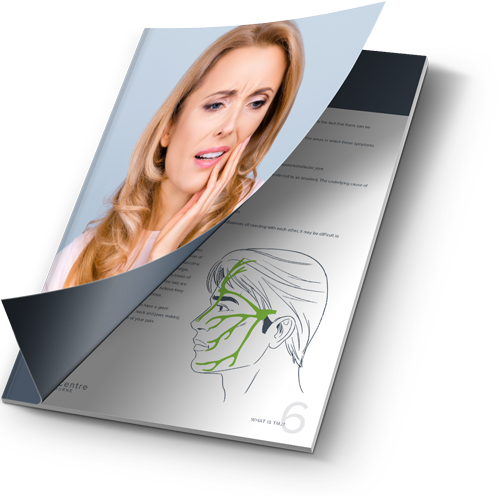 Due to the varied nature of TMJ syndrome, it is unfortunate that many people do not ever discover the true source of their problem until they have spent far too much time and money pursuing other avenues. Below you will find a wealth of information about the symptoms, causes of TMJ and how the TMJ Centre Melbourne’s unique approach to your treatment could help you. TMJ affects 20–30% of the adult population and is more common in women and those between the ages of 20 and 40. The symptoms are varied and include clicking, popping, or grating sounds coming from the jaw; muscle pain that can be felt in the cheeks and temples; jaw joint pain; and severe tension headaches. Though the tension headaches aren’t life threatening, they can be debilitating. 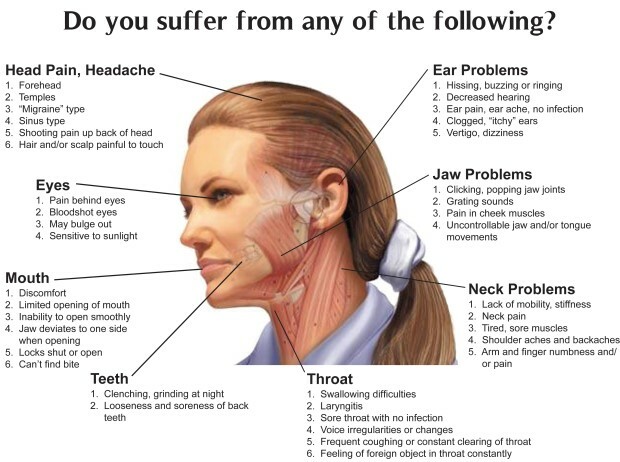 The following is a list of some of the more common TMJ symptoms. No two patients with TMJ disorder experience the same symptoms and pain. Please also understand that this list may not include every symptom a TMJ disorder patient may experience. Do these sound familiar? Could you be a candidate for treatment? Complete our TMJ questionnaire. What is the cause of TMJ dysfunction? Stresses on other areas of the skeletal system, e.g. neck and lower back and sometimes even foot dysfunction. All too often, the foundation of the problem will be a combination of many different causes, which are all interacting and exasperating each other. This is why it is so hard to identify the original cause of the problem and why a holistic approach is best for effective treatment. Because neck pain, migraine headaches and tooth problems may stem from a number of other causes, general dentists and family doctors often ignore the possibility that TMJ is the culprit. In other instances, dentists or doctors may recognise a bite problem, but are at a loss for how to find its cause. While the causes of TMJ/TMD may include tooth grinding, physical injury, structural issues and several underlying disorders, we combine a unique neuromuscular approach that addresses the underlying causes of your bite problems. To truly understand TMJ, one has to understand the complex relationships between teeth, muscles, jaw joints, cranium, neck, brain, and the nervous system. The majority of dental providers in Australia are not specially trained in neuromuscular diagnosis and treatment. What's involved in your TMJ Treatment? At TMJ Centre Melbourne, we take a holistic approach to treating TMJ disorders and pain. Our experienced TMJ team of Dentist and Chiropractor work very closely together to provide an effective, lasting solution for you. The first step is a comprehensive and dynamic diagnosis to see if your symptoms are truly a jaw problem or if they are coming from another part of the body. Together we are able to assess the entire structure of the body and ensure we have the correct diagnosis. By receiving your diagnosis from a Dentist and Chiropractor working together in the same clinic, you will see results faster. This coordinated approach is unique throughout Australia and the world. Only at TMJ Centre Melbourne can you receive such effective treatment for your TMJ disorders and problems. As a professional and experienced dentist, Dr Shah can correct any issues with your bite, teeth, or the position in which you hold your jaw, with the main focus always being on reducing stress upon the TMJs, muscles and improving breathing. Dr Shah uses a combination of neuromuscular orthotics, low level laser therapy, trigger point therapy, prolotherapy and treatment of breathing dysfunction as necessary. 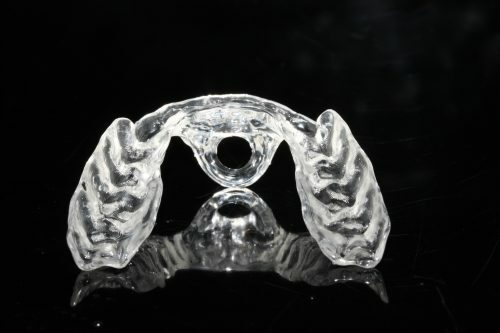 Custom neuromuscular orthotics are very different in function to splints, mouth guards or bite plates. Orthotics allow the muscles to relax and maintain ideal joint function, therefore helping eliminate pain, clicking and locking. 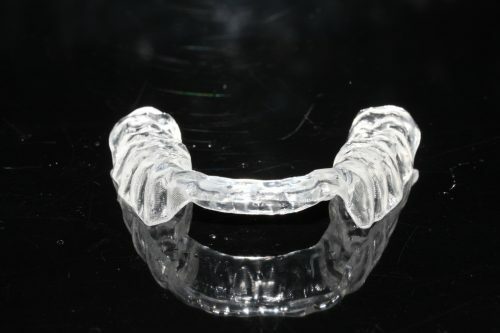 These devices are designed to be as invisible, accurate and as thin as possible using CAD/CAM technology. He works in close consultation with Dr Dowker, a Chiropractor who reduces dysfunction within other areas of the body, particularly in the cranium, hips, neck, and back to diminish or remove the pressure that the body is placing on the TMJs. With over 35 years of experience in treating TMJ, Dr Dowker places special emphasis on treating cranial dysfunction. When done correctly, gentle adjustments to the Cranium provides fast relief from TMJ, neck and headache pain. There are no high velocity thrusts or rapid rotations. With this stress removed, the chances of a full recovery of the TMJs are greatly improved. Together Dr Shah and Dr Dowker will also assess your sleep and need for nutritional support to reduce inflammation in your body and therefore help you get better faster. With a Chiropractic adjustment minutes after your neuromuscular orthotic is fitted, your body can get to work sooner on restoring the balance in its system. Our emphasis is non-surgical treatment, taking away stresses from the TMJ and allowing the body to heal itself. 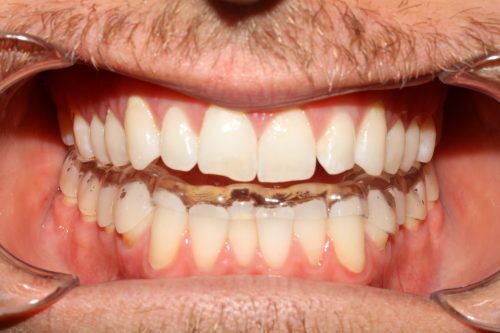 Treatment is always dependent on the severity of the case; some patients may only require a minor adjustment, whilst others will need multiple sessions to see the desired result. To find out how our team can help you, book your consultation! Your comprehensive guide to TMJ Syndrome.